Facebook has taught us to define whatever we’re feeling, thinking or doing in 420 characters, and to share that information with those around us. So it’s only a natural reflex that we want to take our enthralling status updates offline and display them to the outside world as well. Now those Facebook profile costumes are a bit much for any day other than October 31st, so the UpdateMeTee is exactly what we need. 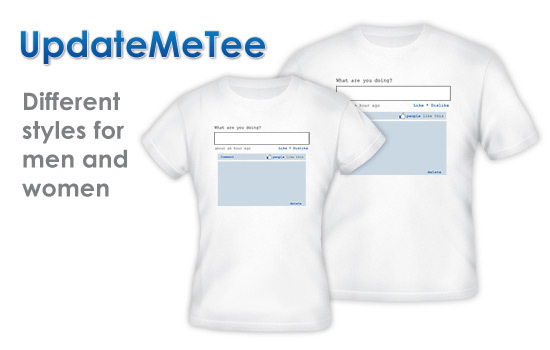 Boasting a rewritable surface, the 100% cotton UpdateMeTee enables you to write and erase status updates on the fly. 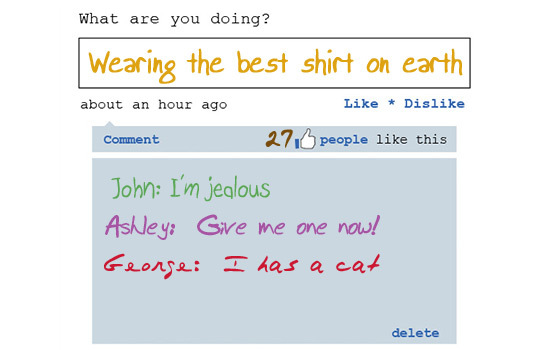 There’s even enough room for your friends to write down comments! Just remember to bring along the random colored Crayola Washable Marker that comes with t-shirt. Do not iron the writable region as it will melt and possibly ruin your iron. Machine wash cold. Gentle cycle. It is not recommended to use a dryer. Hang dry or use the air dry feature of your dryer. Avoid heat. Blue and black markers have a tendency to leave trace stains on the shirt. Red, orange and green work best. Do not use Sharpies, unless you want to immortalize a specific status update. Erase the message every 1 to 3 days, just to be safe. That can’t be too hard for you, status update shifters, can it? » Get your own UpdateMeTee. TIP: We’re not sure if this works, but we read somewhere that you can get free shipping by writing “I was drunk” in the comments section while ordering. Doesn’t hurt to be a pretend drunk and give it a try! Posted by Pieter on November 24, 2010 at 4:29 PM. Use this trackback if you're linking this story.